4 letters South Korea 2018 pictures description with four pics one word traditional, at an event, dance, assortment. The world is in Olympic fever on February 2018 ! 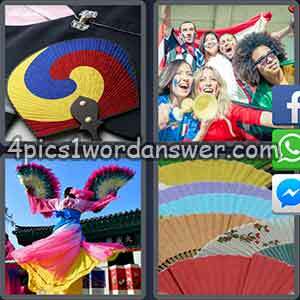 Catch Olympic fever with the 4 Pics 1 Word South Korea Edition ! Solve new daily puzzle about South Korea and the Olympics to earn medals and win special edition Olympic badges from the 4 pics 1 word South Korea Edition !